Schematic diagram of a trigeneration system. Trigeneration systems produce heat and electricity which in turn can be used for heating, cooling and hot water heating systems in a building. Electricity produced can also be supplied to the grid if not needed on the site. Trigeneration systems are more commonly used in buildings with readily available waste heat and intense 24 hours operations. In a developing country like India, high volume of waste heat is generated around the year which could be used to produce heat around the year. 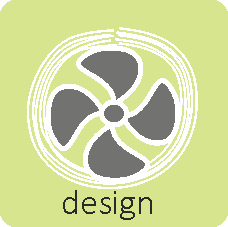 Thus a technology which uses thermal energy to provide cooling could be a solution to our rising energy crisis. In many buildings like hotels, hospitals, and industries, there is a demand for hot water along with air cooling. Such a scenario is well suited for the application of Tri-generation concept. A tri-generation system produces three forms of energy, i.e. electricity, heating, and cooling which could be used to generate power, hot water, and air conditioning with suitable equipment. The principle of tri-generation is based on the generation of heat energy. 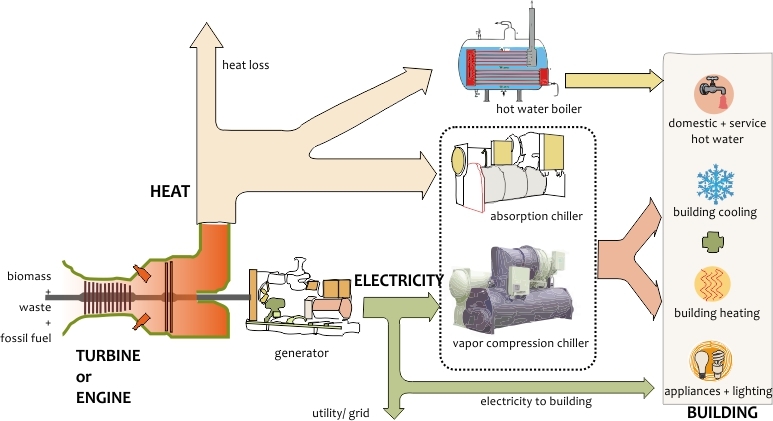 Heat captured through burning waste, production of electricity with generators, or heat generated through solar panels could be used to generate hot water through heat transfer equipment or cold/ chilled water with absorption chillers. Potential for using tri-generation systems has been identified to be nearly 500 to 1,000 MW in India. Tri generation technology, also known as Combined Cooling, Heating, and Power (CCHP), comprises of a gas engine or a power system operated by burning waste, bio fuel, or fossil fuel to produce electricity. The connected heat recovery system is used as a heat exchanger to recover heat from the engine or exhaust. This recovered heat can be used for heating applications like hot water or a regeneration process in absorption chillers. The electricity produced within the tri-generation process could be used to meet the building loads or power chillers during peak load period. The thermal energy could be diverted to boilers to heat the water used in hospitals, hotels, and industries for numerous purposes and/ or to absorption chiller to heat the absorbent and refrigerant mixture and regenerate the absorbent. 1000 TR air conditioning load. Components to meet the heating and cooling loads include a gas genset (1.7 MW), 600 TR capacity Vapour Absorption Machines (VAM) with heat recovery, and electrical chillers of 400 TR capacity. System Cost Total capital cost including DG backup was 9 crore INR. Additional capital investment for the Tri generation system was nearly 3.4 crore INR. Cost of power generated through the Tri generation system (using natural gas) is 3.4 INR/ kW. Net savings of 3.8 INR/ kW or approximately 3 crore INR annually is achieved through this system. System Performance The system provides uninterrupted and reliable power supply, without any fluctuations to the hospital. Power supplied by natural gas is more environmentally friendly than the coal based power supplied through the grid. Operating cost of this system is 1.36 lakhs INR per day compared to 2.25 lakh INR for using electrical chillers running on grid supply.